Unlike any other place on earth which may have trees and magical forests, sacred mountains, lakes, rivers and curious creatures, Sri Dhama Vrndavana is directly the transcendental body of Bhagavan Sri Krishna. The verse quoted above, which proves that Vrndavana Dhama is non-different from the spiritual body of Bhagavan Sri Krishna, is cited in many sastras i.e. 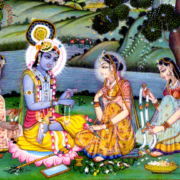 Bhakti-rasamrta-sindhu (3.4.76); Brahma-samhita verse 43 tika of Sri Jiva Goswami; Gopala Campu (1.1.18); Krishna Sandarbha 106; Brhad and Laghu-Vaisnava Tosani (chapter 11). Saints say that Govardhana is Visnu Parvata, and He is also the tilaka gracing the elegant forehead of Govinda’s transcendental body of Vrndavana. “The entire Vrndavana community of millions of gopis, cows and calves has descended from Goloka Vrndavana. In Vraja, lacs of blossoming lotus-eyed gopis worship Sri Hari with the flowers of their ecstatic emotions. Before we get to the main point of this post, let’s hear some Vraja dhuli mahima, about the greatness and transcendental significance of the sacred dust of Vrndavana. “We should understand that the dust of Vraja is the foot dust of Srimati Radhika. Endless honey-sweet streams of mahabhava flow from Sri Radharani’s lotus feet to saturate the dust of Vrndavana with the nectar of Her astonishing love for Krishna. Besides these few entries, there are literally hundreds of sastric statements and poems in Sanskrit, Bengali and Hindi glorifying the power and benefits of the amazing transcendental dust of Vraja Bhumi. All of these scriptures prescribe going barefoot on parikrama, and thousands of years of tradition have upheld this injunction. Unfortunately, today we see lots of Vraja yatris performing parikrama of Giriraja, Vrndavana or Radha-kunda while wearing regular shoes, thin “baby” shoes or layers of socks. Acts of devotion like parikrama are included in the fourth limb of nava-vidha bhakti (pada- sevanam). The purpose all sevas like chanting Hare Krishna japa, studying Srimad Bhagavatam, worshiping Krishna murtis, and parikrama is to please Bhagavan and receive His blessings. We highly doubt that Sri Krishna will be very happy with or bless anyone who walks on His transcendental body (Vrndavana) while wearing shoes and socks on his/her feet. All these things may be true, but what about the gain gotten from the pain of surrender? Sadhu vani says that one can get Krishna prema in Navadvipa Dhama from Harinama Sankirtan; in Sri Ksetra Dhama from eating Jagannatha maha-prasadam, and in Vrndavana Dhama prema from contacting the dust, Vraja dhuli. But how will this prema-giving, mercy-rich, sweet dust of Vraja get through the shoes and layers of socks? When prema is waiting for the taking, pampering one’s feet over receiving the mercy of Vraja is a most paltry proposal. For centuries, yatris and the saints of Vraja have covered themselves with the precious dust of Vraja—seeing it as the ultimate goal of their lives. When Krishna’s uncle Akrura arrived in Vrndavana, he rolled in the dust of Vraja and honourably held it on his head. It our cherished hope that the gentle words appearing here will encourage devotees to do whatever it takes to make Krishna smile. Our motto should be: “Soul first, body second”. In other words, perform acts of sacrifice by depending on Krishna, and watch what miracles of mercy manifest in your lives. Vraja dhuli ki jai! Vrndavana Dhama ki jai! 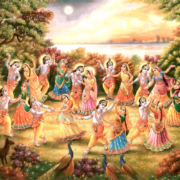 Jai Jai Sri Radhe!